May 24, 2018 -- The fact that so many people are coming to the Houston region is outstanding. It’s a sign of our success. The Houston region is attractive because of our strong economy, good quality of life and affordability. But these attractive qualities aren’t guaranteed. To remain competitive, we must be forward thinking and we must push ourselves into unfamiliar territory. People don’t want to live in a city or move to a city that feels stagnant. Our region’s transportation policy must be geared toward leveraging this growth into a more economically competitive, equitable, and resilient region. When we talk transportation, we need to be thinking not just about moving cars, but about connecting people to economic opportunity, creating great walkable places that people enjoy, attracting the next innovative workforce, (like the next Amazon), and even reducing flood risks on our city. We cannot think narrowly. We must make sure that our transportation investments create a compact, livable and sustainable city that attracts major corporations and the most talented people and corporations in the world. It is all about enhancing connectivity and getting people to their destination as quickly and safely as possible. Note: Mayor Turner frequently deviates from his prepared remarks. Today I want to lay out the types of transportation projects our region should embrace to create a more competitive and livable Houston. And, I will start with transit. For Houston to be competitive and livable, transit is the most critical component of our future transportation system. Let me start by commending Metro on their development of a new long-range transit plan that is addressing growth in the region. Getting the MetroNext plan right is critically important to Houston’s success. The MetroNext Plan should lay out the bold steps needed to keep Houston moving for the coming decades even as we grow and our regional core becomes more compact. First, MetroNext must identify how to connect Uptown to Downtown, two of our largest activity centers, with fast and reliable transit. Connecting these centers will enable these centers to become even more vibrant and walkable while minimizing congestion. In order to connect Uptown and Downtown, I’m asking Metro to look at not just the Richmond and Westpark corridor identified through the 2003 METRO solutions plan, but I believe we will also need a connector along I-10. These two east-west connections would complete a four-sided network with METRO’s Red Line and the Uptown bus rapid transit. This grid transit system will create a backbone for strong transit connections to many dense areas in our central city and can link the future bullet train rail station in the Northwest Mall area to Downtown. And let me pause for a moment to reiterate the tremendous opportunity that the bullet train from Houston to Dallas presents to the Houston region. Imagine a relaxing 90-minute trip to Dallas, free of congestion or the need to drive. The challenge now is to ensure the terminus of this rail, at the former Northwest Mall site in Houston, is redeveloped into a walkable and vibrant center of economic activity that is well-connected to other activity centers with fast, reliable transit. I’m pleased that Metro is planning for connecting the rail station to Downtown, Uptown and other activity centers, since these connections are critical to leveraging the bullet train’s opportunity while minimizing congestion. The second transit issue the MetroNext plan must address is the reimagining of the region’s HOV system. Sustained growth has led to other dense activity centers developing around the region, not just inside the Loop or in the Galleria area. At the same time, more people are choosing to live inside 610. As a result, we are seeing congestion in both directions of our freeways, at extended times throughout the day. So, in order to keep the region moving, the next generation of our HOV system must have 2-way service on all freeways, 7 days a week. Imagine if you could hop on a bus to come downtown to see an Astros game in the evenings, or ride a bus from your home in the City’s core out to jobs in Greenspoint or the Energy Corridor… or ride a bus from the suburbs into the Museum District on a Saturday. METRO and TXDOT must work together to make this a reality. My third transit priority is to connect the inner city to both Bush and Hobby airports with quality, reliable transit. Our airports are the gateway to Houston for many of our visitors, and Houston needs a comfortable and convenient connection to and from our airports that provides visitors with a positive image of Houston. For Bush airport, I am challenging Metro to fully explore a rail connection and to ensure TxDOT’s I-45 project accommodates such a connection. If rail to Bush is not feasible or practical, Metro should establish a signature bus service. Hobby Airport is also a hub for regional business travel and an extension of light rail is a natural connection to Hobby. Metro should look to leverage its dollars with those of the private sector to maximize these transit connections. The fourth transit opportunity that the MetroNext plan must explore is the full integration of buses with the City streets they operate on. While I would like to see more high-quality rail and bus rapid transit options across the region, I recognize that bus is an economical and flexible form of transit, and most transit riders will rely on the bus for some or all of their trips. So let’s look at creative ways to improve bus service. Let me give you an example. Many park and rides move rapidly once they are on the HOV lanes on freeways. But a bus can take 20 min simply to traverse downtown. We must improve bus reliability and speed through activity centers and on major thoroughfares. We must look at how we can improve bus operation on city streets through smarter signal timing, dedicated or preferred lanes, better sidewalks and safer intersections. Providing travel time advantage for buses will be critical to improving ridership and providing everyone with an opportunity to move quickly about our city as we grow. The City is ready to partner with Metro to make this happen and MetroNext should fully consider this potential. Before I shift off of transit, I want to say a word about how technology is affecting how we move. Houston has been selected as 1 of 22 cities for the Smart Cities Collaborative, organized by Transportation for America, to explore how new technologies and new transportation options are changing the way we move around cities. We know that ridesharing services (like Uber and Lyft) are now commonplace and autonomous vehicles are rapidly approaching. These new technologies can and should be an important component of achieving our vision for mobility. These technologies can complement transit by providing for last-mile service. The City and Metro are both looking into autonomous vehicles and how they can be used to our advantage. Autonomous vehicles hold promise for transit use, and I commend Metro for researching an exciting pilot project for use of autonomous vehicles on TSU’s campus. I believe the dedicated guideway for the Uptown bus rapid transit system makes that project a potential opportunity for autonomous vehicles as well. I do want to say that, despite their promise, autonomous vehicles or the use of ride-sharing services are unlikely to be a panacea that solves our congestion problems. In fact, they may make congestion worse as more people use a ridesharing service or is in their own autonomous vehicle. Are Uber, Lift, ridesharing services and AVs changing the paradigm as it relates to public transit? Will they reduce ridership or complement public transit? What must be a part of our public transit design or what must we offer to make our public transit system attractive to the potential user? And what must we do to increase ridership? I remain convinced that transit must continue to be the solution we look towards to move more people more efficiently on our limited rights of ways. But transit is not the only solution. There are other important initiatives and policies that Houston must embrace to build a stronger, more resilient and sustainable Houston. TxDOT’s multi-billion dollar North Houston Highway Improvement Project will improve travel times for those going to and from downtown Houston from the north, and for those traveling through Houston. This significant redesign of I-45 North and US 59/69 through downtown offers a once in a generation opportunity to fix many of the problems created when many of Houston’s highways were first constructed, and even to turn the freeway rights-of-ways into civic opportunities for our region. The project will reconstruct I-45 from Beltway 8 on the north through downtown, and includes portions of I-69 and I-10 near downtown. You can think of this as fully reconfiguring the plumbing in our Houston house. I want to thank TxDOT for working closely with partners around the regions to explore improvements to the design. This project is exciting because it has the potential to reconnect neighborhoods divided by the existing highways. It has potential to create great civic spaces for people to gather and more greenspace where the freeway can be placed below ground. Opportunities exist to create gateways with unique designs and iconic bridge structures. Where we cannot create signature structures, we should do what we can to minimize the visual impact of the freeway, and work towards making the freeway disappear. Because of the tremendous opportunity presented by this project, I have convened an I-45 Task Force of civic leaders to identify how the project can be designed to maximize the benefit this project will provide for Houston. I challenge TXDOT to go beyond just listening to community stakeholders, but to actually change some of their plans to incorporate design solutions that are appropriate for an urban context. In the core of Houston, we need urban frontage roads with slower speeds and enhanced accommodations for pedestrians and cyclists. City street crossings of the freeway must incorporate these solutions as well. I’m very excited about the possibilities this project presents. This project could be leveraged to help create the “Green Loop” around downtown Houston, a 5-mile transportation and recreation circuit that connects Downtown to adjacent neighborhoods, first envisioned in the recently completed Plan Downtown. Imagine riding a bicycle or going for a jog around downtown Houston on safe, dedicated bikeways, along our bayous and through park spaces. This is the future of Houston! I also encourage TxDOT to fully incorporate important infrastructure enhancements into the project, including the potential relocation of the existing east-west freight rail line along the north side of downtown Houston, and channel improvements to Buffalo Bayou. The I-45 task force is also looking at major civic opportunities for green space in Midtown, downtown, and other areas of the project. The City will be aggressively pursuing enhancements of this project and partnerships with TxDOT and other entities to maximize this opportunity. Many of the ideas that are being generated will require investments by the City, County and our many partners in the private sector. Let’s work together to seize this truly significant opportunity. I want to talk about bicycling as well. As we continue to develop a more compact urban core, Houston must become a more bicycle-friendly city. The Texas Medical Center is already proving this concept, where bicycling already represents around 4% of all travel trips, nearly 8 to 10 times the mode-share citywide. This transformation is possible on a broader scale. We must do more to make Houston a safe place to ride a bicycle. The first step toward a safer system is strong, comfortable bicycle infrastructure. 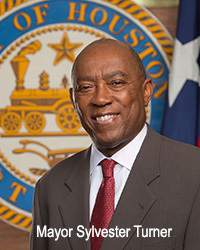 I want to thank Commissioner Rodney Ellis, who has kick-started our implementation of the new Houston Bike Plan. We are fully committed to using the $10 million he has contributed, plus over $5 million in City (CIP) funds, to building over 50 miles of new, high-comfort bicycle facilities. And with the Commissioner’s help, we will have these facilities constructed in just one year! The City also recently created a Safer Streets program to identify locations of safety concern for pedestrians and bicyclists and fix these locations using relatively inexpensive, yet effective solutions. I have asked the Houston Public Works Department to work with BikeHouston and the City’s new Bicycle Advisory Committee to start by identifying ten locations of high-priority safety concerns for pedestrians and bicycle riders. Once identified, Houston Public Works will evaluate these locations to assess whether the street design is contributing to the safety concerns. If so, the City will quickly implement solutions to improve safety. Once we complete the first round of ten locations, we will reassess the program and consider extending it to another ten. But bicycle infrastructure alone is not enough to make Houston safe for people who want to ride a bicycle. We must all work together to change the culture so that drivers are respecting people riding bicycles. And yes, people riding bicycles must follow the rules of the road as well. I cannot say this enough: Houston has a safe passing ordinance that all drivers must obey. That means that all drivers must maintain a minimum of 3 feet between the edge of your vehicle and a pedestrian, cyclist, or someone in a wheelchair [or moped, or someone on horseback, by the way]. If you are driving a truck or commercial vehicle, the requirement is 6 feet. The City is enforcing the safe passing ordinance and you will be cited if you violate it. The injuries and fatalities that people riding bicycles are suffering are unacceptable [and I am asking/have asked police chief Art Acevedo to aggressively enforce this law?]. I’d like to leave you with one last thought about the resiliency of our region. Resiliency and mobility are inextricably linked. In a post-Harvey world, we know we must use smarter transportation policy to create a region that is less prone to flood risks. Since I came to office, I’ve been pushing all our partners for a paradigm shift in transportation investments. Focusing our transportation investments in the core of our region, rather than in the periphery, will make a more sustainable, less congested, and more resilient region. In the past five years, over 50,000 acres of land are now experiencing development activity within 3 miles of the recently completed segments of the Grand Parkway. And much of these developments drain to Buffalo Bayou, Brays Bayou, Cypress Creek, and Greens Bayou. That means that, over time, these channels will experience an even greater volume of runoff than they do today. Yes, I understand that these developments are required to provide detention for their runoff. And yes, there are drainage improvements like channel widenings or new detention ponds or reservoirs that will be part of that solution. Still, Hurricane Harvey was a watershed moment for this city. This event demonstrated that we have to be smarter about our regional transportation investment strategy. The strategy of building new freeways through vacant land as a means to open land for development has serious consequences: requires serious regional planning. Urban sprawl comes with costs. Focusing on the core would create a more sustainable, more resilient and less congested city. Houston’s future must be building up, not out, to sustain our success. I am challenging the entire region to work together in this direction. As the Houston-Galveston Area Council develops its 2045 Regional Transportation Plan, I would like all of our regional partners to consider the lessons of Harvey, and develop a 2045 Plan that fosters a sustainable and resilient region. This is in all of our collective best interest. Thank you. I look forward to working with all of you to create a smarter, more sustainable, healthier and more resilient Houston.